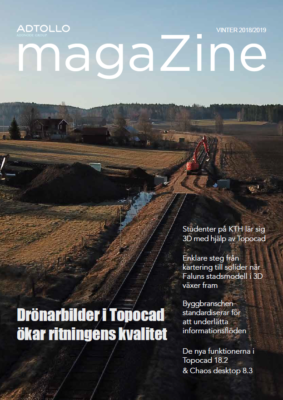 Topocad is a complete 3D CAD system with good features for designing an excavation, roads, tunnels and sewage ditches. With the help of three different modules: geometries for longitudinal road lines, volume calculation models for the calculation of excavation and volume sections for all handling of cross sections. Result from cross sections and design is automatically transferred to solids, BIM ready. Design of excavation takes place directly in the 3D CAD position where excavation is planned. From this, a theoretical terrain model is created, which is then compared with the soil model. It is also possible to calculate the shafts directly from excavation outer edges towards a measured soil and/or rock model. The results are reported as volumes and a terrain model for machine guidance. Thanks to Topocad’s handling it is easy to design both simple and advanced elongated object. You can work with multiple sections that merge into one another. Calculated sections can be edited and all volume calculation is done directly, interactively. The result in the form of sections can be exported to various machine control format, but it can also quickly create terrain models from the sections for machine guidance. Topocads handling of sections is very well developed and handles all kinds of different sections.